The Performance Enhancer course is a coaching course to enhance teachers’ performance in class and the organisation. 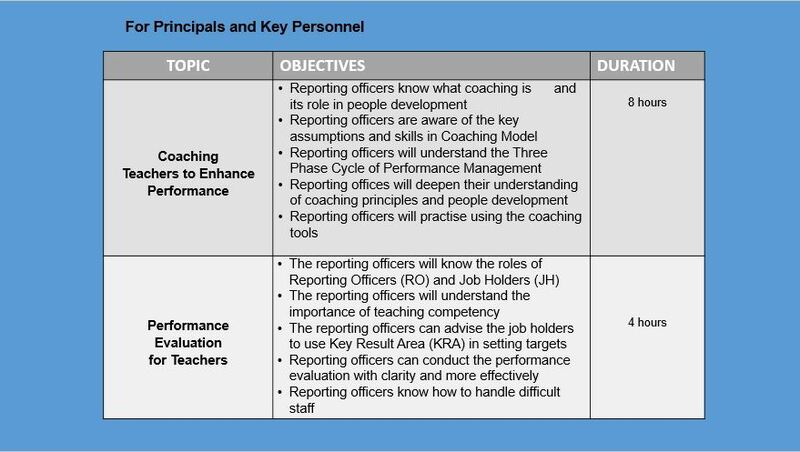 The course is for key personnel of the school and the tools used will give reporting officers a better understanding of their roles and tips on better managing or developing their Job Holders. There are times when reporting officers have to manage difficult staff. The course gives them the impetus and tools for this challenging task. 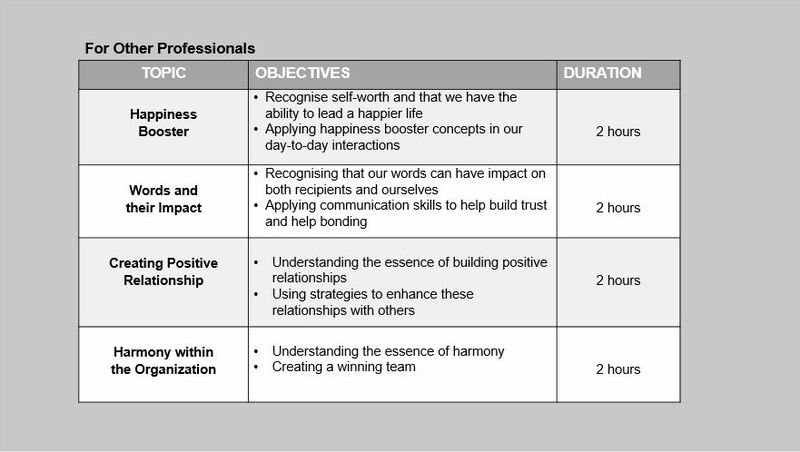 “The “Happiness Booster Programme” is based on Positive Psychology, “The How of Happiness” by Sonja Lyubomersky. 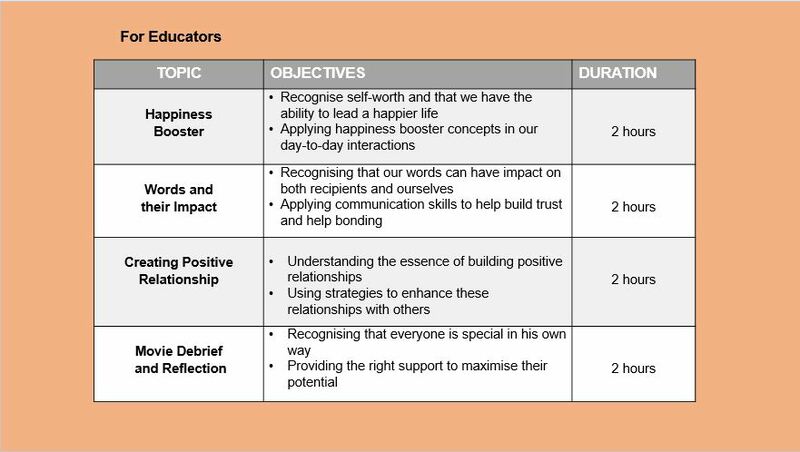 The “Happiness Booster Programme” is underpinned by theories and research on happiness. At the end of the programme, participants will learn that happiness is a choice and not end result. They will also understand that happiness level can be raised through training and their indulgence in certain activities. Allow us to share, what determines Happiness. At birth up to 50% of happiness is from the genes of parents (mom & dad). This is the Genetic set point. The next 10% is mostly due to life circumstances, e.g. Money, house, marriage, promotion, celebration etc. Interestingly, the next 40% of happiness is due to intentional activity. Our training is based on what Lyubommirsky has suggested, “If an unhappy person wants to experience interest, enthusiasm, contentment, peace and joy, he or she can make it happen by learning the habits of a happy person”. We want to bring this good news to people and teach them strategies and ways to raise their happiness level. The outcome of the training should see staff becoming more motivated and happier in their work environment and stay on course to achieve their organisational goals. The course deals with both parents and students as a package. Schools are finding it difficult to relate well with parents . 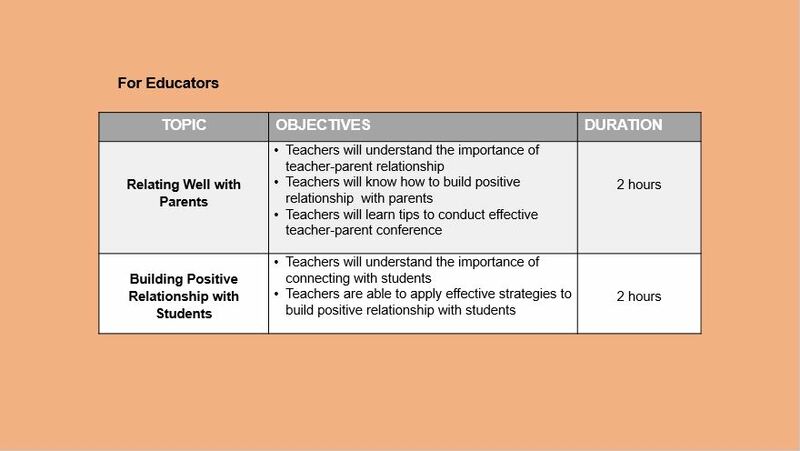 Through the training , teachers are taught how to build a positive relationship with their students’ parents and conduct effective teacher-parent conferencing. The second part of the training focuses on building better teacher-student-relationship, which is important in today’s educational context. Teaching students today is not the same as it was perhaps ten years ag0. The course will train teachers how to make connections with their students and build better relationship with them. The course targets teachers who are in charge of student volunteers, especially the uniform groups. 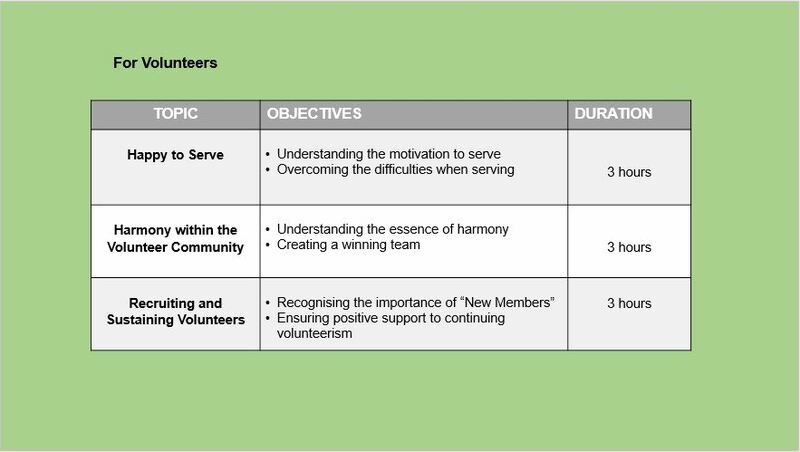 It is not easy to get students to volunteer their services and worst still to retain the volunteers. The training gives teachers ideas and ways to motivate students and make them happy to serve, retain them and sustain their interests. We can also tailor the course for students based on the school’s needs. 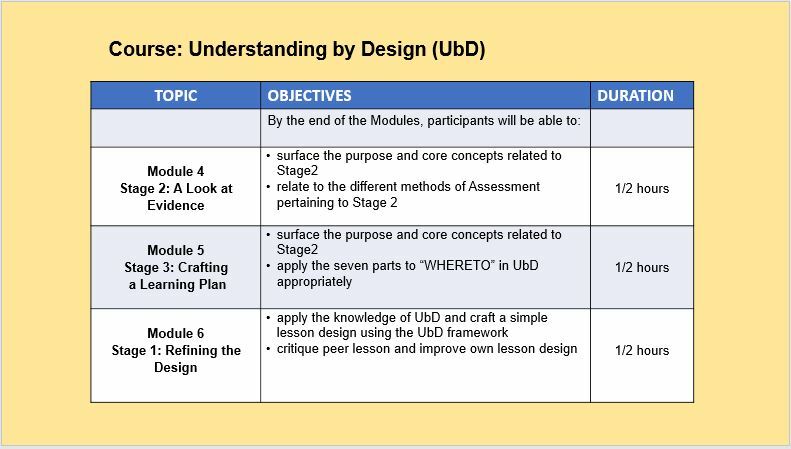 In Understanding by Design, participants will explore how the principles and practices of Understanding by Design® (UbD) can help them get the most out of your instructional time. Schools are simply not achieving results due to the “double sins” by teachers, as described by authors Grant Wiggins and Jay McTighe, “Activity focus” and “Content focus”. The course will re-align participants’ focus and help them get on track towards achieving desired results. Participants will learn practical ways to put UbD™ to work in classrooms. 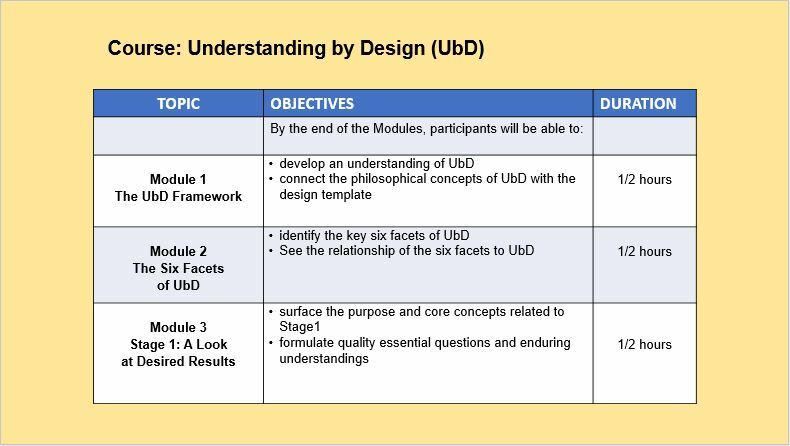 At the end of the course participants will learn how to design a simple lesson using the UbD framework. This is a course that looks at real understanding of concepts taught in the classroom through a backward design principle. Teachers do not have to ponder anymore why they are not achieving results with their students. Herein lies the answer! 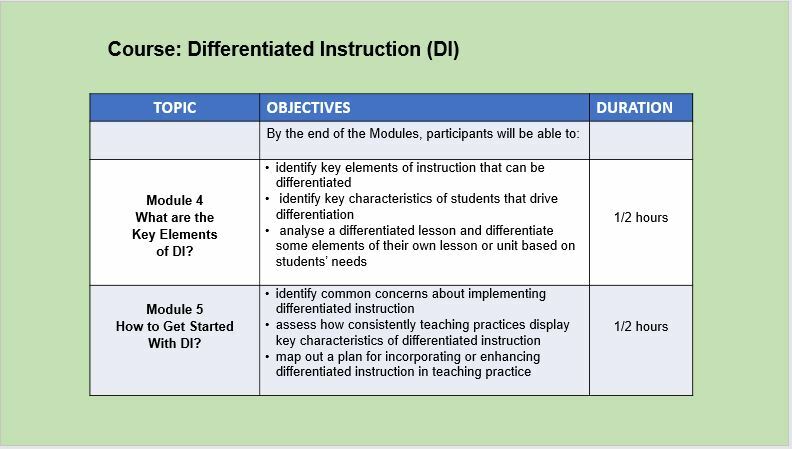 In this Differentiated Instruction course participants will build a conceptual understanding of the model of differentiated instruction (DI), including the philosophical underpinnings of this model. 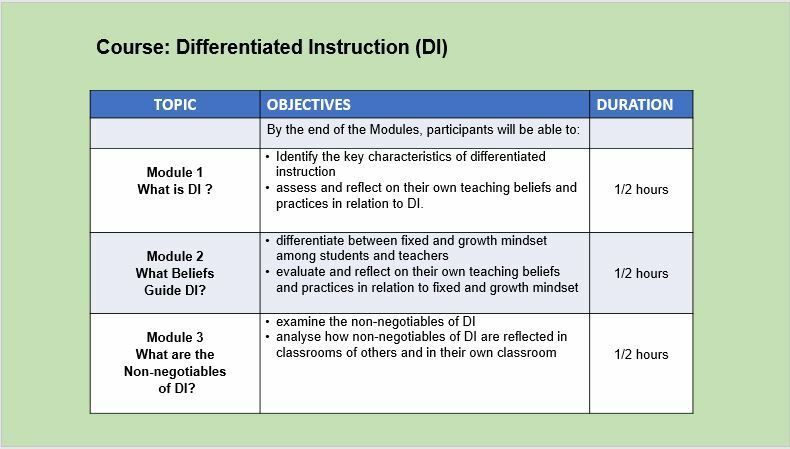 They will explore characteristics and key elements of differentiated instruction, as well as beliefs that guide the DI model. Participants will learn about the five non-negotiables of differentiated instruction, namely high-quality curriculum, welcoming classroom environment, ongoing assessment, flexible grouping, and respectful tasks. Next, they will discover how differentiated classrooms differ from traditional classrooms and what concerns teachers have about practicing differentiated instruction. 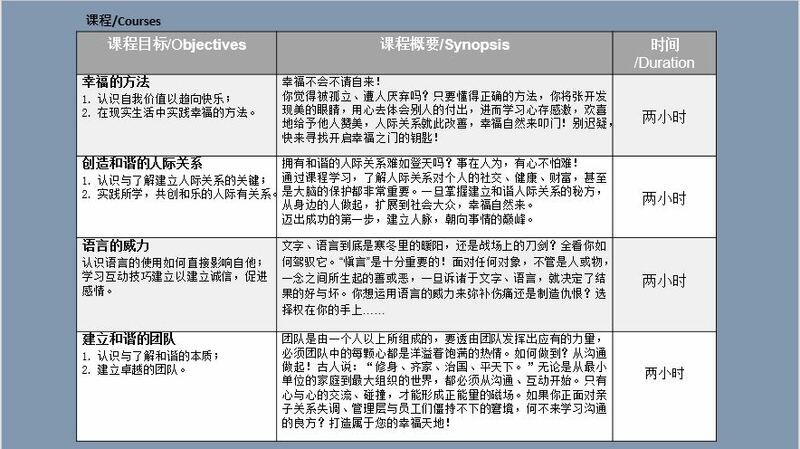 They will also review the steps for getting started with differentiated instruction. By the end of this course, through practical applications, participants will be ready to start planning for differentiation in their classroom for any subject. The course will deepen teachers understanding of DI and show them ways to impact students. This is the change that teachers need to enhance their teaching in the 21st Century. Move away from being a traditional teacher to one that makes a difference in the classroom. 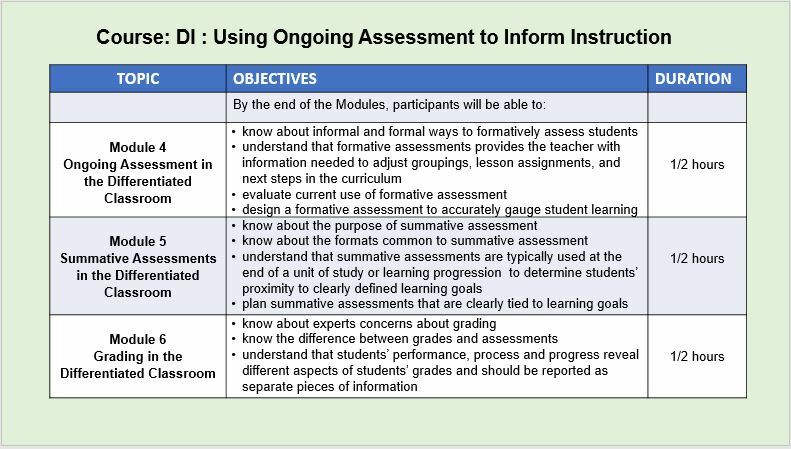 In Differentiated Instruction: Using Ongoing Assessment to Inform Instruction, participants will learn how teachers in a differentiated classroom plan for ongoing assessment and use information collected from assessments to inform instruction. 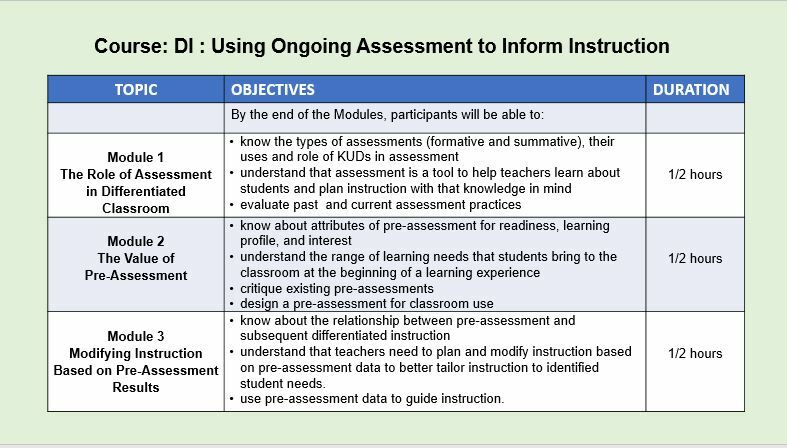 Through video examples, slides, readings, practical applications, and personal reflections, participant will be ready to start planning both formative and summative assessments in their differentiated classroom and using the data collected for instructional and evaluative purposes, as appropriate. More specifically, participants will learn about the roles of formative and summative assessments in the differentiated classroom. They will use a variety of techniques and strategies for collecting and reporting this data appropriately. Participants will learn how to approach grading in a way that reflects best practices and supports continued student effort toward learning in the differentiated classroom. For maximum benefit from this course, it is best that participants have completed the earlier Differentiated Instruction (Introduction) Course before embarking on this one. In this digital age of the 21st Century, teachers and students are both using mobile devices and other technology to teach and learn. 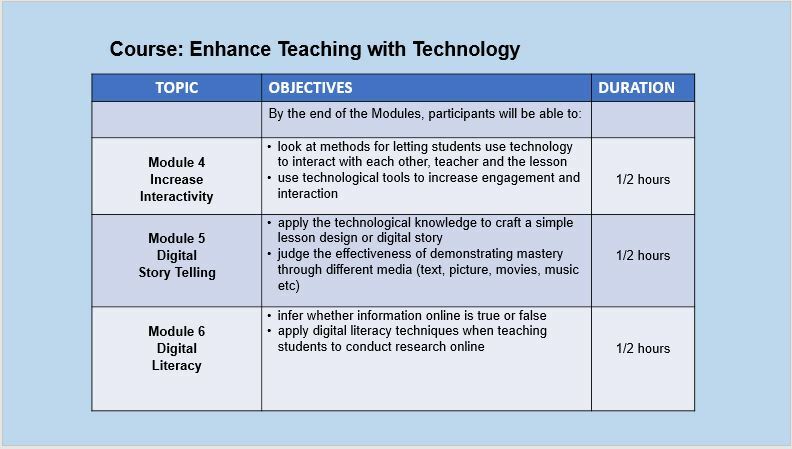 This course is designed for the classroom teacher who is looking for the technologies available to enhance his/her teaching. First, participants will learn about ways social media can help them improve their practices and create a personal learning network. Then, they will learn about collaboration tools that can be used for planning or delivering effective lessons. Participants will learn about mobile apps that engage students in learning and digital storytelling tools that allow students to show what they’ve learned. Finally, the course covers ways to teach students about digital literacy and citizenship to be safe online. This is an eye-opener course for teachers who have little knowledge or no knowledge of technology. It is never too late to learn about technology use in the curriculum. 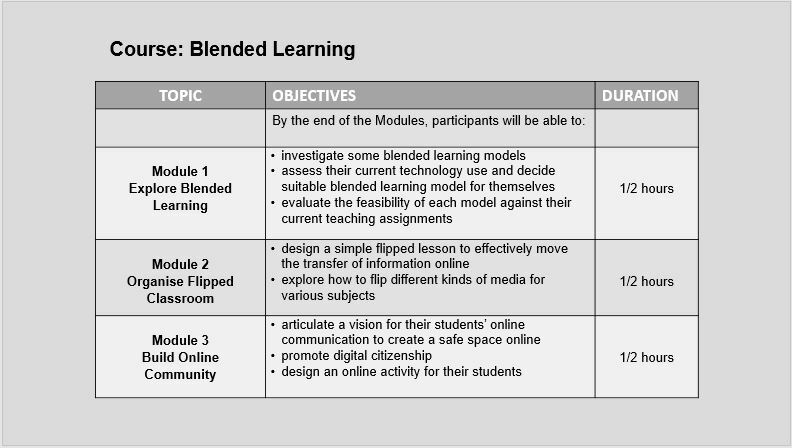 At this moment in the 21st Century, there is a growing trend in education at all levels toward blended learning models. This approach requires teachers to rethink their roles in the classroom. This course will introduce participants to the various blended learning models used in education in other parts of the world. Author, Catlin Tucker, shows ways of exploring the implications of a blended learning model on teaching. She suggests that teachers strive to achieve one version of blended learning, the “flipped classroom.” In the flipped classroom environment, teachers must learn to weave online and face-to-face experiences so that maximum learning takes place. The course guides you through online community building exercises that must happen for students to have successful online experiences. 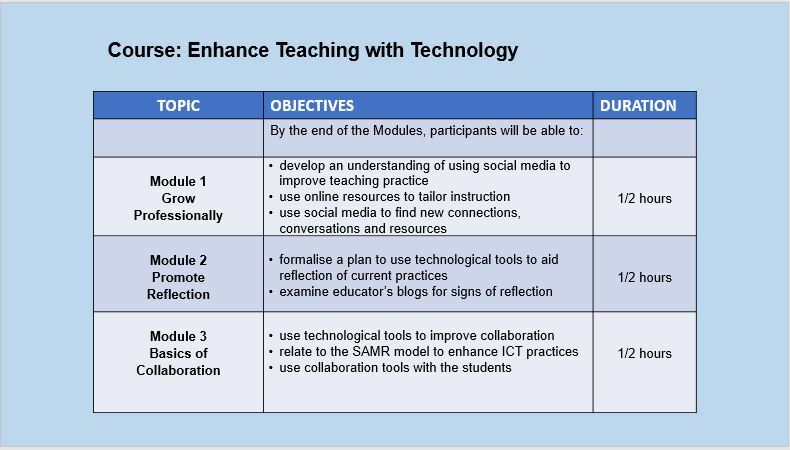 Participants will find out that the flipped classroom model can be achieved in many ways and is not video dependent. In addition, the course covers the importance of asking good questions that elicit critical thinking from students. 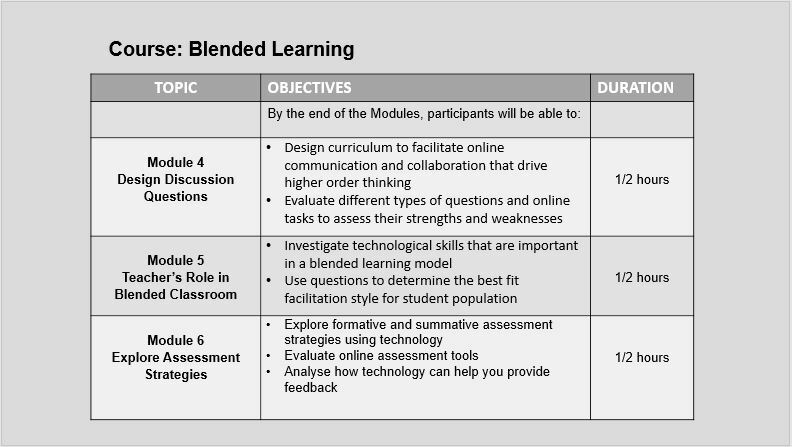 Lastly, the course presents appropriate assessments for this blended learning model. Teaching has moved forward in the rest of the world and this course will ensure that you are not left behind!